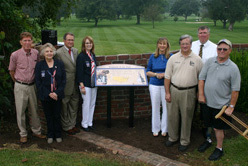 On Thursday, August 27, 2009, the Ohio National Road Association (ONRA) unveiled the first of 60 interpretive signs to be placed along the Historic National Road throughout Ohio. 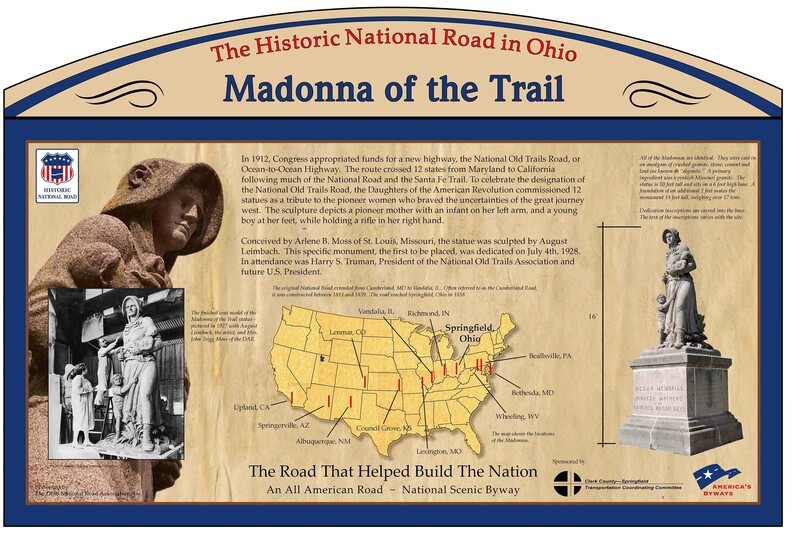 The August 27 th unveiling took place at the Madonna of the Trail monument, located about 500 feet west of the entrance to Snyder Park, on West National Road in Springfield. The interpretive signs are designed to educate and enhance the traveler’s experience on the Historic National Road in Ohio. National Road interpretive signage campaigns have already completed in Maryland and West Virginia, Ohio joins Pennsylvania, Indiana, and Illinois as the most recent Historic National Road states to launch such a campaign. 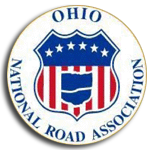 Ohio National Road Association extended sincere gratitude to Tim Smith, Director of the National Trails Parks and Recreation District (NTPRD) for the hard work and dedication of the NTPRD staff in preparing the site for the unveiling ceremony. Also recognized for their contributions to the project were the ONRA signage committee, ONRA Board of Trustees, Deb Keddie of Walkabout, Inc., and Zachary Balassone of Clark County-Springfield TCC for his design efforts in with this project. Attendees of the ceremony (Left to Right) Ed Kemper, Denna Johnson, Clark County Commissioner John Detrick, Cyndie Gerken, Marian Vance, Bill Hart, NTPRD Director Tim Smith, and Paul Seibel. 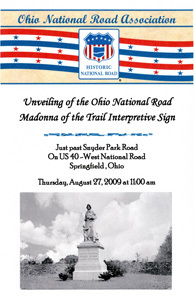 The Madonna of the Trail statue and its Ohio National Road interpretive sign were moved from their location in Snyder Park on Sept. 21, 2011. 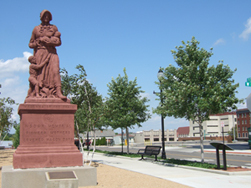 You can now find the statue in downtown Springfield in the new National Road Commons park which is bounded by Main, Fisher and Columbia streets. 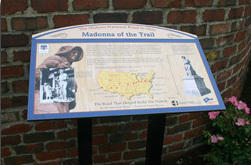 The Madonna of the Trail faces Main Street (which is one-way heading west) at the NW corner of Main and Fisher streets, just west of the Fairbanks Building and one block west of N. Fountain Avenue. The Ohio National Road interpretive sign was moved to the new park, but actually was installed to face Fisher Street as can be seen at the right side of the photo. 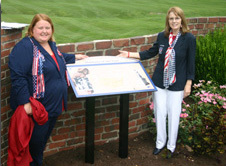 The Madonna of the Trail Interpretive Sign was unveiled by (left to right) Thea Walsh, Director of the Clark County-Springfield Transportation Coordinating Committee and Cyndie Gerken, President of the Ohio National Road Association.